Note: Just double click on the picture and you will get the enlarged version. My friend Erik Kaye, now living in Japan with his wife Corinne, sent this and a series of other paintings to us. 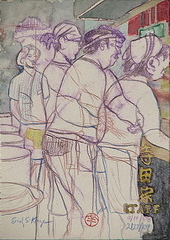 This particular painting is a beginning of his series on life in Japan. 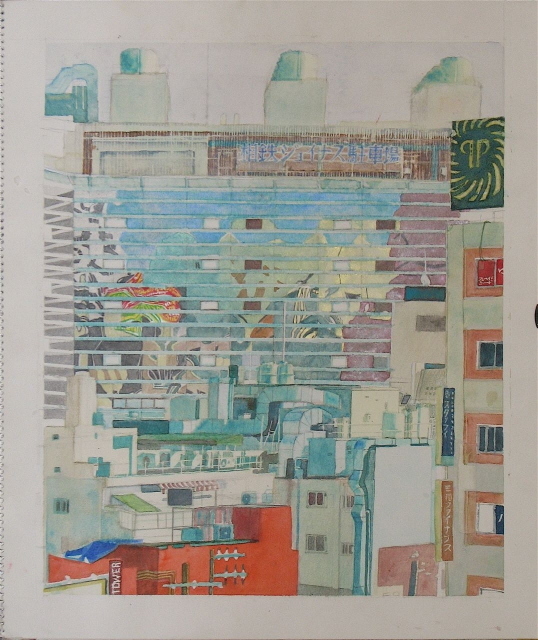 He has others of a trip to India as well as several abstracts. Really beautiful. “Megane: Kintaro’s Eyeglasses, that’s pronounced Meh-gah-neh, which is the word prominently spelled in reverse in the upper left-hand corner of the windows, and means eyeglasses. The cartoony head beside the big word is Kintaro– Golden Taro or Golden Boy– a folk legend who is the mascot for “Megane Do-rah-gu* (Megane Drugs Incorporated). This is another in a series of watercolors of Japan by Erik Kaye. He has been living there with his wife since the late nineties. “Its a famous nearby temple, Ryukoji, (ji means temple-Ryu means Dragon, Ko means mouth– Dragon Mouth Temple) where the Saint Nichiren was being executed when a bolt of lightning hit the axe-blade as it was being swung to his neck. The superstitious fools of that time refused to believe it was completely coincidental! Of course we today know differently, heh, heh. Ka-ta-se is the name of the town. —–Erik Kaye, American Artist working with his wife Corinne as English Language teachers in Japan. Note: Eric says this is a composite picture inspired by a rave celebrating the viewing of cherry blossoms at Yoyogi Park in Tokyo. Eric says the whole country goes crazy for roughly two weeks in the spring when the cherry blossoms come out. I love you Erik! See you soon! I’m in San Diego now. LOVe!